I first saw Zervas and Pepper on the recommendation of a friend at the SummerTyne Festival two years ago when they were doing a 15 minute showcase; but enjoyed them so much I bought tickets to see them support a much bigger act that I wasn’t keen on, later in the evening. 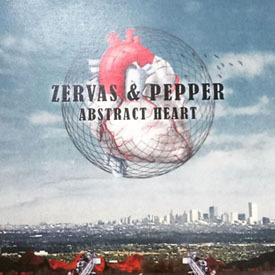 Over the last few years I’ve seen and reviewed a few bands and singers who are overly influenced by the West Coast ‘sound’ of the late 60’s and early 1970’s but no one has captured the magic spark in quite the same way as Zervas and Pepper; possibly because this duo do it so naturally. This is the couple’s third album; and their sound and songwriting has matured beyond comprehension; with opening song Miller sounding as if it was from a lost album by CSN & Joni Mitchell; with the harmonies seeping out of the speakers like warm fresh honey and the backing musicians are as sharp as a tack. The rest of the album is in exactly the same vein with Zervas and Pepper alternating on lead vocals as the other supports them like a steel girder. If Abstract Heart had been released in the halcyon days of AOR and hit singles Foolish Dreamer, which is full of Byrdsian jangly guitars and the Pentangle meets Tom Petty influenced We Are One would never have been of your radio. The title track Abstract Heart is not to be dismissed lightly either; as it’s not just a handsome piece of music but when you move closer you will hear a really deep and powerful set of lyrics; much like their heroes in Laurel Canyon. Grow your hair and break out the loon pants; Zervas and Pepper are going to be the sound of the Summer.